Purchased from Didier Aaron & ie., Paris, 1980. These wonderfully carved torcheres relate closely to a design by Jacques-François Blondel (1705-1774), a leading ornementaliste and designer at the court of Louis XV and the nephew of the architect François Blondel (1683-1756). The design for 'torchères pour la décoration des appartements' appears as plate 94 in the second volume of his 1737-8 treatise De la distribution des maisons de plaisance. 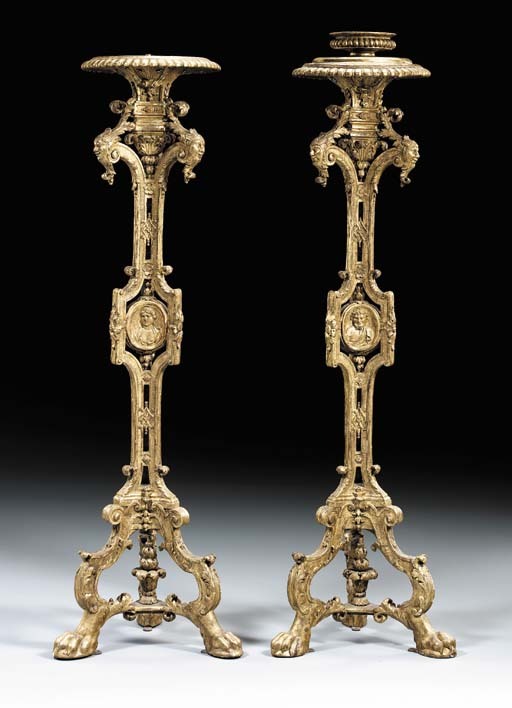 A pair of blue-painted and parcel-gilt torcheres of similar design were offered anonymously at Christie's London, 15 June 1995, lot 41. A related suite of four silver guèridons commissioned in 1741 by Queen Sophie Magdalene of Denmark, and inspired by Blondel's designs, were supplied to the King's Audience Room at Christianborg Palace. Created by the royal silversmiths Philipp Jacob VI Drentwett (1717-54) and Bernard Heinrich Weyhe (1735-82) via the dealer Michael Rauner, the guéridons were transferred to Amelienborg (M. Bencard, Silver Furniture, Rosenberg, 1992, pp. 100-101, nos. 64-67).